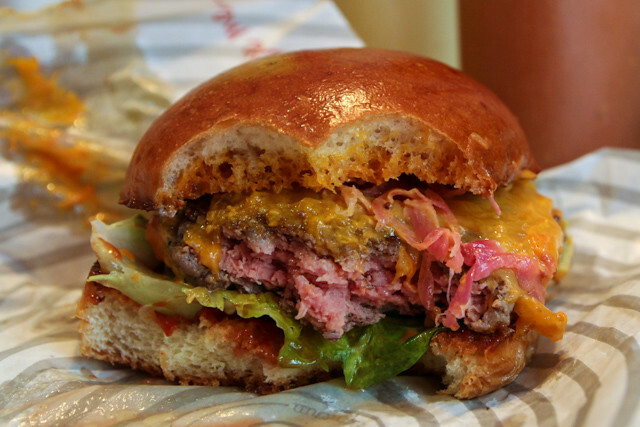 When it comes to finding a good burger in London, you'll surely come across Patty & Bun. 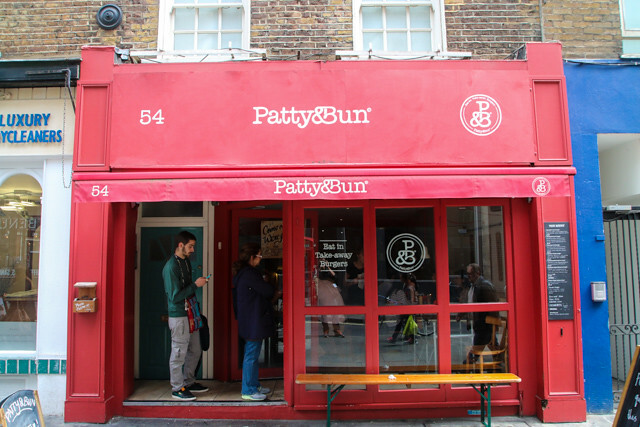 On my short visit to London, a friend on Facebook mentioned I should go to Patty & Bun for a burger, and I would not be disappointed. I didn't actually make plans to go to the restaurant, but I wrote it down, along with my other list of restaurants, as a place to potentially eat. We happen to be walking around Oxford Street one day, mostly doing some shopping and just browsing, and all of a sudden my map radar showed that we were down the road from Patty & Bun, and it happen to be 11:55 am on the dot (it opens daily at 12 noon). In light of our circumstance, we decided to try the burger. Having been in Tokyo the month previously, I was expecting a mile long line down the sidewalk, but luckily on this day we were only five minutes early, and were the first ones in the door as soon as they opened. There's also a 5 Guys in London, that I walked past, which is always packed with a line out the door. The menu at Patty & Bun, a simple piece of paper, was placed on the table in front of us. There were just six simple burgers to choose from, and a number of different sides like salads, chips, and chicken wings. The waitress kindly asked how cooked we wanted the meat, to which she recommended a medium rare, and I accepted. Since we were first in the restaurant and first to order, our food came first (and by this time, 10 minutes after we arrived, they were pretty much full). Though it's a sit down restaurant, the food was served fast food style; there were no plates, but the burger just came wrapped in a piece of paper and the sides came in paper bowls. The “ARI GOLD cheeseburger” included a beef patty, cheese, lettuce, tomato, pickled onions, ketchup, smokey P&B mayo (secret recipe), all stuffed into a brioche bun. You'll notice that the bun is not one of those pale white sesame seeded buns that pushes down like a sponge. 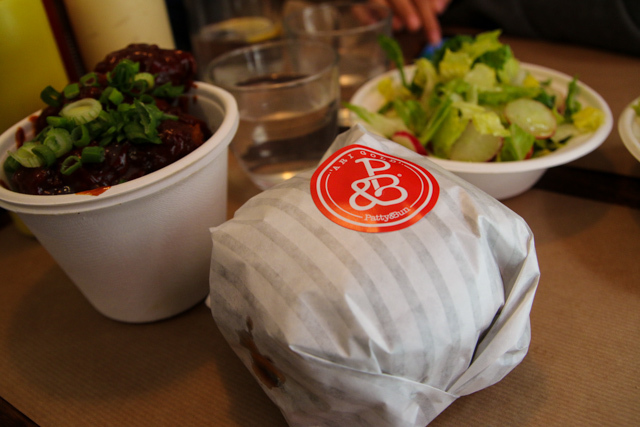 Instead at Patty & Bun they use a brioche style bun, which is a pastry like piece of bread that's buttery and egg-based. The bun had a nice buttery taste, and thick, but still with a fluffy texture. I'm a huge fan of rare cooked juicy meats, and the first first thing I loved about the burger was that it was cooked perfectly – pink in the middle, seared on the outside, and incredibly juicy and flavorful. The blend of beef in the burger was fantastic. They used just the right amount of cheese, and I enjoyed the crispness of the pink pickled onions, though I think some extra raw onions would have been good too. I'm not a huge French fry (chips) lover, so instead I decided to go for a side salad and their famous chicken wings. 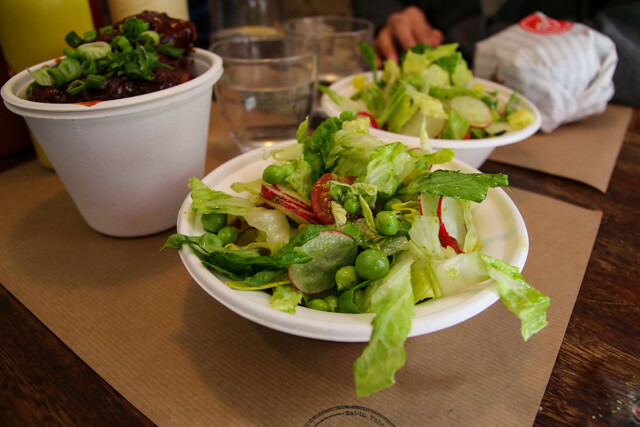 The side salad, dressed in a light herb vinaigrette, was alright, but nothing special. 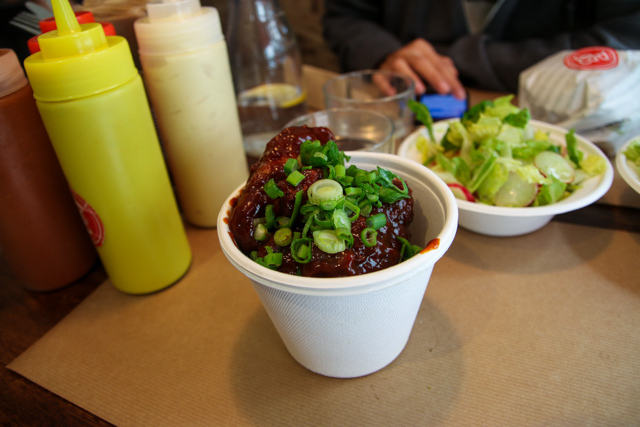 Along with burgers, Patty & Bun is known in London for their chicken wings. I ordered the “Winger Winger Chicken Dinner,” which were smoked confit chicken wings smothered in barbecue sauce. I wasn't a big fan of the chicken wings, they were too soft for me, almost no texture to them, just softness and sweet barbecue sauce. 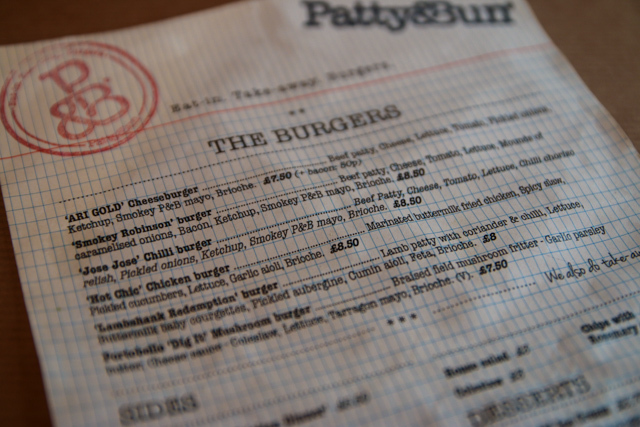 Overall, I enjoyed the burger the most at Patty & Bun. 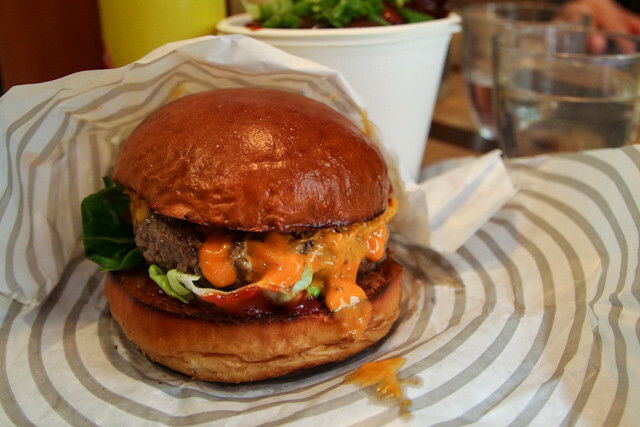 If you're looking for a good burger in London, go check them out. mmm that looks good. Love a burger with secret sauce. My UK friends have pretty low standards when it comes to burgers while we travel together so I’m surprised to read about this place and that they have a 5 guys. I’m craving a burger like nothing else right now. They look delicious. Well, now I’m hungry. That burger looks mouthwatering. Looks delicious! I am going to London for the first time in a few months, and I can’t wait to eat the food! Let me know if you find yourself in Korea anytime soon.. the food here is amazing! That looks delicious even though I am sure it costs more than a weeks worth of street food in Bangkok. I’m too much of a wimp for a medium rare burger, but it looks delicious regardless … I’ll put it in my mental file for when I end up in London!